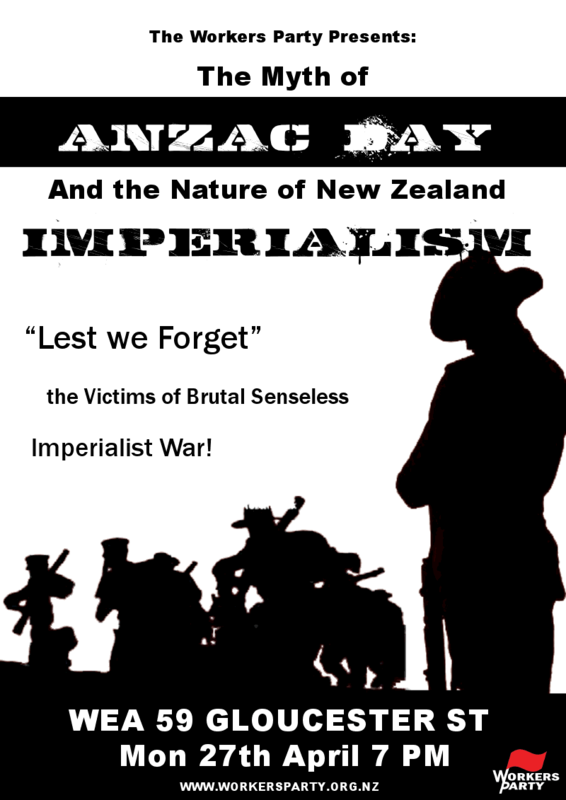 I hope you will oppose Obama’s request that NZ contribute SAS troops to the ‘peacekeeping’ force in Afghanistan once again. I also hope that you will recognise that the Maoist government of Nepal is not only maintaining but stepping up its contribution to the ‘peacekeeping’ force. I think they have as many as 700 troops there. When you put the Maoists’ support for the war in Afghanistan together with their ban on strikes, you can see that they have become a run of the mill bourgeois government which socialists should not support. Sorry, I meant to say that Afghanistan’s Maoists were criticising Prachanda. The link I gave makes my meaning clear. Have you got any more details for this meeting? I can stick it up on indymedia. The notice should be going up on Indymedia thanks Cameron. Martin, yes we absolutely oppose troop deployments to Afghanistan and will be opposing any attempt by the NZ government to redeploy the SAS, which is a very real possibility. I just came upon your website and wondered why you were promoting a government which has troops in Afghanistan and has banned strikes as communist. Funny sort of communism, I thought. The thing we have to keep in mind is that the Maoists don’t yet have state power. And more than that, despite holding the portfolio of Minister of Defence, they do not control the military. A good example of how much control the Maoists actually have over the state buerucracy and the military was when they tried to not renew the contracts of 8 leading generals, effectively firing them for not cooperating with the government. The military refused to accept it and got the Supreme Court to declare the move unlawful, which is currently being challenged by the Maoists. And recently the military boycotted the National Games in protest at the inclusion of PLA teams. The military has consistently said it will not accept the integration of the two armies, and there is increasingly open conflict between the UCPN (M) and the military leadership. And to clarify a few things – the letter against the Maoists is not entirely accurate. It contains the frequently repeated claim that there are Nepalese forces in Iraq, which is not true. And it leaves it very unclear about whether not there are actual Nepalese soldiers operating in Afghanistan under the control of Nepalese officers and the Nepalese military – there are not. There are only soldiers of the British Royal Ghurka Rifles deployed under British control, something that has to be made clear and in that letter isn’t. The Maoist’s haven’t ended Ghurka recruitment yet, but hell they haven’t achieved most of their programme yet, resistance from the reactionary forces that still control the Nepalese state and the uncooperation of their coalition partners has scuppered most of their attempts. The question of how they plan on resolving this still has to be resolved but to condemn them over this one issue in isolation is imo not fair. Their starting to say more clearly that if they continue to be hamstrung and prevented from functioning as a government they’ll stop tolerating it and launch an “insurrection”. I don’t believe we should condemn them hastily before that happens. The letter was dealt with quite well in this post by Mike Ely and there’s a lot of useful discussion in the comments below. Afghanistan is an imperialist war and we should stay out of it, but of course the National government may have different ideas. As for Prashanda’s position on Nepal contributing forces on the ‘peace keeping’ force I am a little shocked and mystified. The RIM need to demand an explanation from Prashanda to ascertain where he is coming from. Maybe his logic (which I wouldn’t agree with entirely) goes like this: Maoism has always condemed religion as being retrograde and reactionary “opium of the people” etc. and maybe Prashanda has put the Teleban firmly in that category. The western imperialist have a laissez-faire attitude toward religion so he seems to have opted for the lesser of the two evils. When the Teleban is eliminated that leaves the Maoist only one enemy to contend with. So what we have to ask ourselves is which society would most democratic socialists (or variations)prefer to live? Western ‘democracy’ or a regime like the Teleban? thankyou for the clarification. But hasn’t Prachnda said he supports the British Gurkhas being recruited by Britain? And Prachanda even met Bush and said he won’t disrupt operations in Afghanistan. I notice you didn’t address the Maoist support for the legislation banning strikes in the ‘special economic zones’. How is that justified? I just came across your site and am curious how a socialist group can support a movement which has clearly become very non-socialist. The first thing to realise Martin is that unlike a lot of Marxist groups/parties in the West, the WP does not consider itself expert on how comrades in other countries should run their revolutions. On the contrary, we feel that we should be focusing on understanding our own country and doing our utmost to build here. We attempt to maintain comradely relations with revolutionary movements in other countries but 1) we don’t blindly follow or endorse everything they do, and 2) we don’t presume to know better. In my experience this is quite an unusual position for a small Marxist party in the West to take, and is one of the main reasons I got involved in the WP, having stayed out of parties for all of my life prior to joining the WP. Clearly we do not “support” strike bans, but we need to be careful about claims like this. It is important to remember that the Maoists in Nepal do not actually hold state power. They are a *minority* without anything like the amount of influence that a lot of their critics imply. The Maoists have been in government for a very short time. They are a minority party.The situation in Nepal is in flux. Nepal is a small, poor, landlocked country with a very underdeveloped economy. It is very easy to get swept up in expectations about what the Nepalese can achieve. It’s also very easy to snipe at them from the comfort of the West. Do I have some concerns? Yes I do. Do I know how things will unfold? No I don’t. At this stage though, I think it is more important and useful to learn than to engage in criticism from the comfort and safety of an keyboard in the West. John I think you are missing the point. The Maoists are not trying to change the policy of banning strikes. It’s their policy. They voted for it. And you are obviously promoting them. I found your site and one of the first things I saw was an article hailing them as revolutionaries. Do revolutionaries ban strikes, shake hands with Bush, publically support the recruitment of troops to serve in imperialist wars? I agree about studying and elarning but how can you learn when you don’t present the real picture? KATHMANDU, Jan 16 – The major six political parties on Friday reached an agreement to declare the indispensable service sectors such as hospital, industries, transportations and custom offices as shutdown prohibited zones. During a meeting at the prime minister’s office in Singha Durbar this morning, the six parties took the decision to avoid strikes at the places that provides highly essential services so as not to breach the rights of trade unions, while the main opposition party Nepali Congress (NC) expressed note of dissent. Emerging from the meeting, Minister for Information and Communications and government spokesperson Krishna Bahadur Mahara said that the parties drew the government’s attention to the construction of short term, mid term and long term plans to end the crisis of load shedding. He added that the government is serious towards it. At today’s meeting, the major parties have also reached an agreement to reconstruct the “Koshi grid’ at the earliest for connecting 90 MW of electricity to-be-imported from India to national transmission line, to scrap the licenses of those who have not initiated the electricity production work and to acquire some percentage of the electricity from the company that have been operating thermal plant in order to slot the power in the national transmission line. Likewise, the parties also drew the government’s attention to reduce the electricity supply in the prime minister’s official residence, ministerial quarters and the government offices as there has been a widespread public concern over unnecessary use of power in those sectors. In the beginning of the meeting, Prime Minister Pushpa Kamal Dahal asked the seven parties not to be the obstruction in resolving the crisis, saying that the country is passing through a hard time. Main opposition party Nepali Congress (NC) Vice President Ram Chandra Poudel said that they sought the government’s attention towards resolving the crisis of water, waste management, journalists’ killing and the reduction of broadcasting by private TV channels among others. Ruling out the possibility of ending shutdowns and strikes so as to deprive the trade unions of their right, Poudel informed that his party will take decision on that only after consulting with party leaders. The meeting of the major seven parties has reportedly decided to form a task force to prepare a report after consultations with various sides and stakeholders to cope with the crisis faced by the people. This was in September 2008. The following month, Nepal increased its commitment to UN ‘peacekeeping’. Nepal has troops in Haiti, Lebanon, and East Timor. The article on your website about Nepal is dated December 2008. It says things like ‘the workers are confident in the knowledge that the government will support them when they take these actions’. Well obviously not! Given the WP’s strong stance against NZ peacekeepers in East Timor, it should make WPers uneasy that Prachanda is so much in support of it. Alastair, John, do you have any ideas on why he would promote such crap? Perhaps he can’t afford to piss off the military too much? I know very little about Nepal so won’t comment further on it. Martin, I think you in tern missed John’s point about not being too judgemental about other people’s revolutionary activities. There could be many factors we, sitting at home in the West, have know idea of. Don’t you think the Maoists deserve more time to achieve their goals? Shouldn’t we reserve judgement for at least a few more years, before condemning them as sell-outs? Martin, I agree with John Edmundson it is not for us to pass judjement on another party in another country when we are uncertain of the whole situation. However you may be 100% correct Prachanda could be selling out which is why I would like see him challenged directly by his own party or the RIM. When countries are in flux all sorts contradictions arise as Mao says “all sorts of freaks and monsters come out of the woodwork”. One has to make deals with all sorts of unsavory characters if the means serves the ends. Maybe Prachanda is doing what Lenin did before the 1917 revolution and I quote “play one capitalist against another”. However that is just pure speculation on my part. I think it would be better to get it from the horses mouth. Certainly not. You will *never* be certain of the whole situation. You will never be certain of the whole situation in the USSR under Stalin. Does that mean the WP should uncritically support his regime as ‘socialist’ or ‘communist’ too? Get real. I wouldn’t say WP needs to write off the entire party, or their entire program, because of specific disagreements. However, when a party leaders *own words* (and votes in government) support positions which are clearly against the WP’s values, the WP needs to acknowledge and criticize those positions, or render itself a cheerleading squad for any aspiring ruling class that decides to clad itself in socialist costume. I don’t know an aweful lot about Nepal either, but it’s my suspicion that the emperor wears no clothes. I don’t think that would be possible, Stalin has been dead for quite some time and the USSR no longer exists. We don’t uncritically support the nepalese maoists, so I don’t see how that can be transferred into uncritically supporting the USSR under Stalin.